If you think you've got what it takes to be a part of our dynamic and unique community, drop us an application below! Habbos who are currently volunteering for another fansite can join roles that does not conflict with their duties on the other fansite (permission must be granted from the other fansite). They must also not hold any senior or managerial position on the other fansite. We reserve the right to decide whether you can be on the team, and you should declare this in your application. Applications that lack effort will be rejected - so please avoid one-liners. The role of a radio presenter is to engage the community with awesome content on the airwaves. A radio presenter should be passionate about radio and music, and have the ability to speak fluently on-air. The role of an event organiser is to come up with awesome events for our members to enjoy. The events can range from on-site forum events to in-game events. Reporters are in charge of covering all Habbo reward-related content and should be comfortable with completing various types of wired games and mazes. This can include but is not limited to: Fansite Events, Independent Events, Live Events, Bundles, Rares and LTD releases, etc. Content writers are in charge of covering all Habbo-related content and updates. This can include but is not limited to: Habbo News, Campaigns, new Furni releases, Habbo Features, Wired Guides, Tips & Tricks, etc. The campaigns & competitions department is in charge of engaging with our members by introducing exciting site competitions, campaigns and initiatives. The role of the NA Events Manager is to manage and oversee the operations of the HabboBites events department, in particular, the NA timezone. Managers must be good team players, firm and approachable. As an events manager, you will enforce discipline and help keep the department active. The role of a moderator is to ensure that all contents posted on the website are compliant to the site's Terms of Service as well as applicable section rules. A moderator should be enthusiastic in his/her role and must be confident in distinguishing the difference between an appropriate and inappropriate content. He or she would be entrusted with authority to enforce and upkeep the content standards on the website. 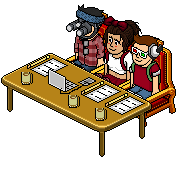 The role of a room builder is to help out in the planning, creation, and execution of Habbo campaigns and quests requested by Habbo. 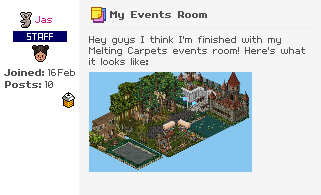 Room builders will work closely with their team leader and Habbo to come up with exciting events! They may also be tasked to build rooms for non-official events and functions. 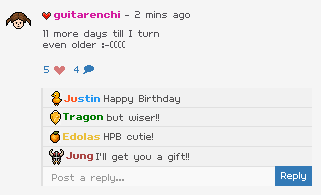 The role of a graphics artist is to create graphics for use on HabboBites, and occasionally, on Habbo for our official events. Graphics artists will work closely with the developers and managers and may have to meet strict deadlines. If you like everything pixel perfect, read on! Note: All work must be original, and made by you. The role of the OC Radio Manager is to manage and oversee the operations of the HabboBites radio, in particular, the OC timezone. Managers must be good team players, firm and approachable. As a radio manager, you will enforce discipline and help keep the radio active. The role of the EU Radio Manager is to manage and oversee the operations of the HabboBites radio, in particular, the EU timezone. Managers must be good team players, firm and approachable. As a radio manager, you will enforce discipline and help keep the radio active. We regret to inform that only short-listed applicants will receive a response. You will be contacted via HabboBites private message - so make sure you check back often! Login to ask about a job!